Known up until 2001 as LTV Steel Mining Company, this operation was shuttered in early 2001 when the parent company (LTV Steel) closed its mine and pellet plant near Hoyt Lakes on Minnesota's Mesabi Iron Range. 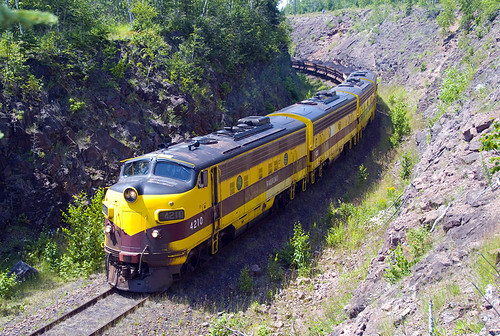 In 2002 large iron ore merchant Cleveland Cliffs purchased the assets of the closed operation, including a 72-mile long mainline railroad linking the pellet plant at Hoyt Lakes to a dock on Lake Superior at Taconite Harbor. To oversee the former LTV property Cliffs formed a subsidiary called Cliffs Erie, LLC (named after parent Cleveland Cliffs and Erie Mining - the original operating company for the mine and plant when built). In 2004, with iron ore prices very high, Cliffs Erie hired a contractor to reclaim the remaining pellets and chips (broken pellets and fines) from the former LTVSMC stockpile area at Hoyt Lakes. 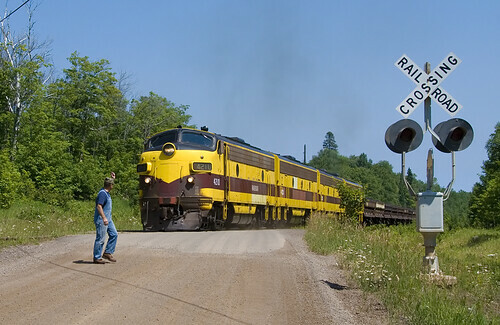 To move this material, in the fall of 2004 Cliffs Erie fired up the only remaining locomotives unsold on the property (all others had been sold off to various concerns after the mine closed) and prepared a train of ore cars for the task. The only remaining engines were the famous EMD F9s that had worked so many years for Erie Mining and LTVSMC. The F9s were joined by sister 4211 (on loan from the Lake Superior Railroad Museum). In 2005 Cliffs planned on running a limited amount of cleanup trains to the dock in early summer. NOTE: Because of the uncertainty of Cliffs Erie moving trains over this route at present, it would be wise to check our update page for timely and accurate information (www.lsrm.org). We also suggest joining the YahooGroup OreRail for current status reports regarding this operation. Both dock and plant areas for Cliffs Erie and Northshore are off-limits, but good photo opportunities can be found if one takes the time to explore the surrounding areas. Radio - Cliffs Erie uses a satellite phone for communications.